The warmer weather makes me more adventurous. 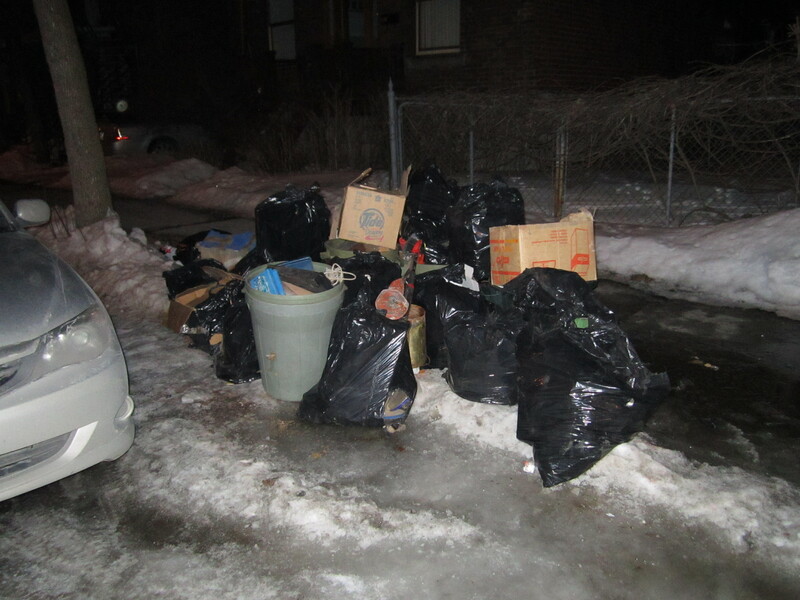 I decided to check out Ville St Laurent’s heavy garbage night for the first time since November. 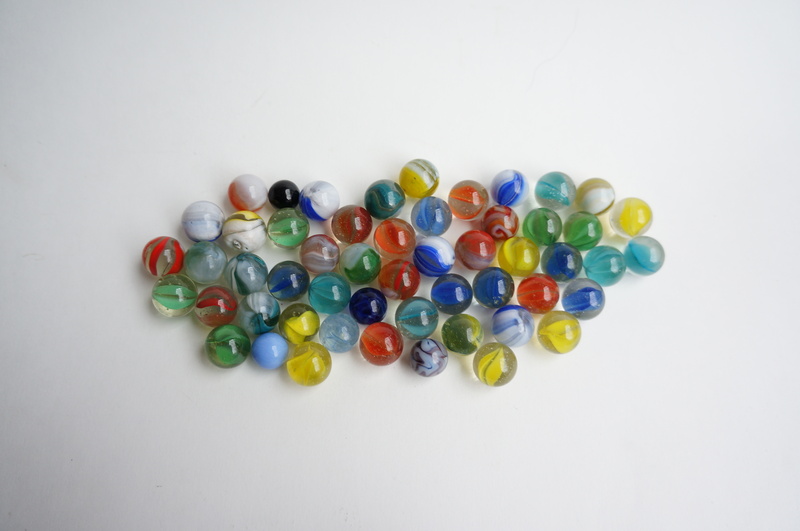 … and a bag full of marbles. I took a different way home, driving east on Cote Vertu and Sauve before arriving in Ahuntsic. I covered a few streets there, which is where I found this intriguing if mucky pile. 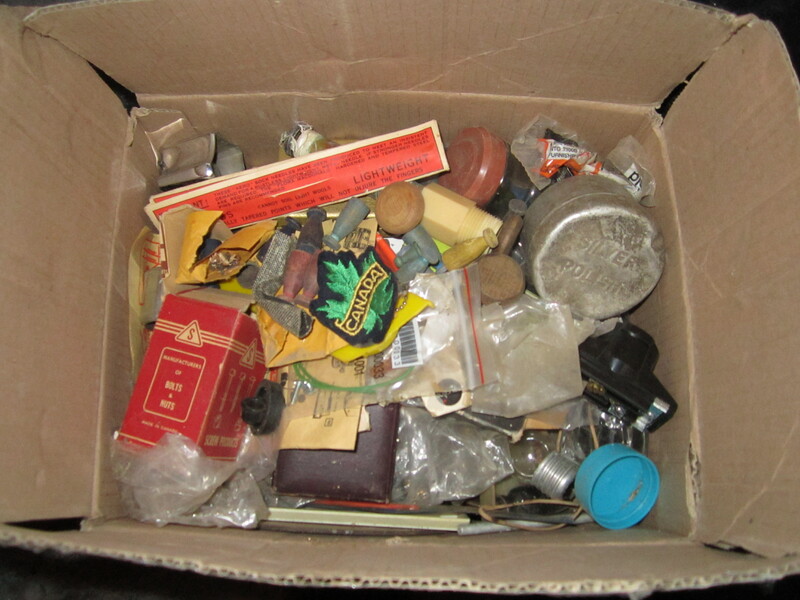 Inside most of the bags were boxes, inside of which was a mix of total junk and interesting miscellany. It was actually quite the hassle to sort through this stuff. 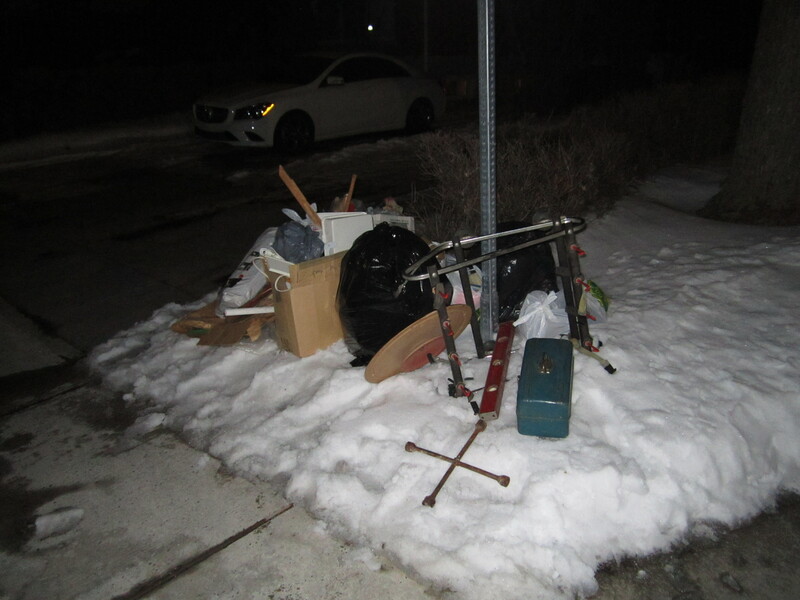 Usually trash on the curb is more compartmentalized – you have your kitchen crap in one bag, the basement stuff in another, the garage junk in yet another. This makes it fairly easily to quickly determine if the contents of a bag are of interest. Here though nearly every box held something vaguely interesting, like an old jewelry box, which was mixed in with a bunch of bric-a-brac, making it necessary for me to rummage around the bottom in case there was more of interest inside (like silver or gold). It didn’t help that there were lots of old, rusty pieces of metal in these boxes, making the contents look more like the embodiment of tetanus than something of potential value. As a result, much care was needed when sorting through the rubbish. Sorting is actually an exhausting process. It takes a lot of brain power to figure out what to take, what not to take, where to put the stuff you don’t want, how not to make a mess, and so on, especially when you have to work quickly. I ended up spending nearly 3 hours sorting through this stuff, and by the end I was starving but too tired to really do anything about it. I got home at close to 4am, which is much later than I usually stay out til. 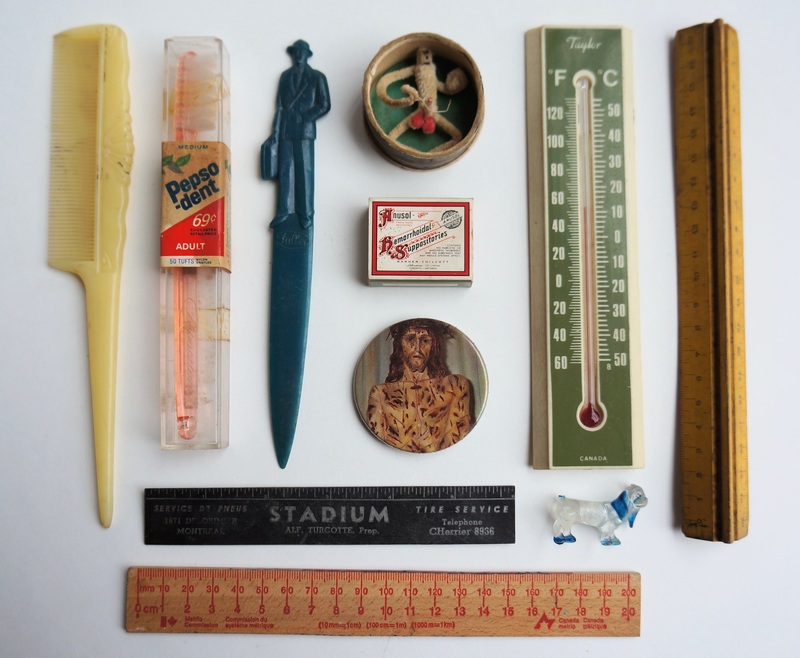 Anyways, I did save a lot of small vintage items, many of which are pretty cool. I won’t go into much detail describing them. Click on the picture if you want a close-up! 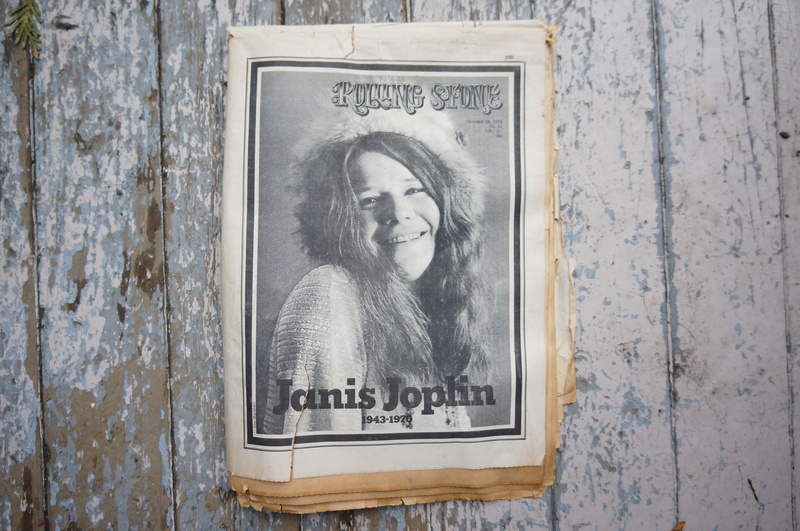 This Woodstock patch might be original, though it’s not worth much regardless. The stain I think is from rust, so it might clean out in a wash. This etching looks a lot like Robin. 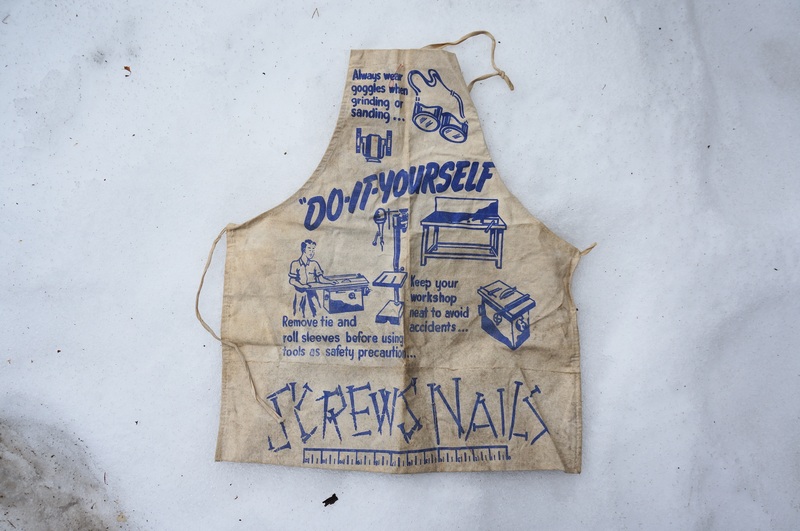 I expect this carpenter’s apron was made in the 1950s, given the fonts used. It needs a wash, but should clean up alright. I was hoping to find some old bits of gold or silver but had no such luck. 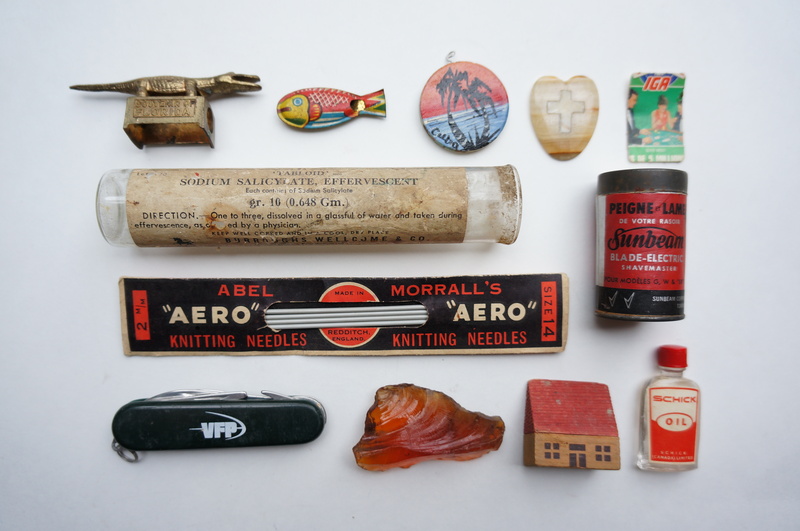 Still, these unusual tools were interesting to find. 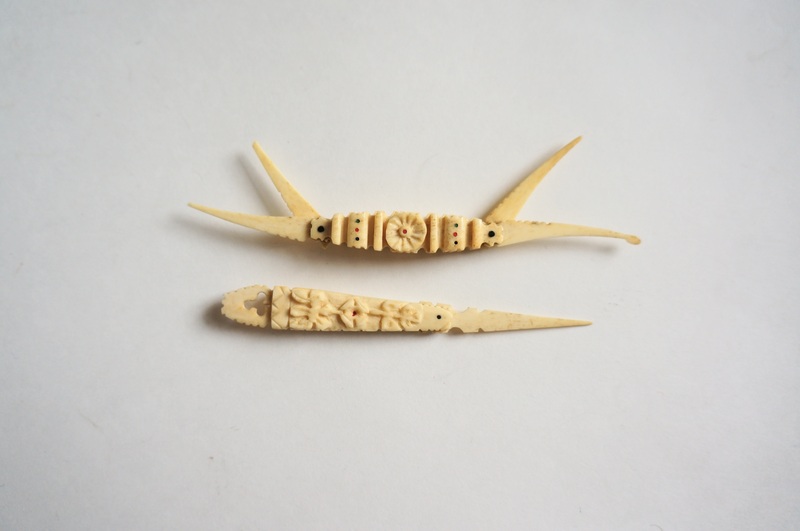 The tools might be made from ivory. If so, it’s the first time I’ve found vintage or antique ivory in the trash. 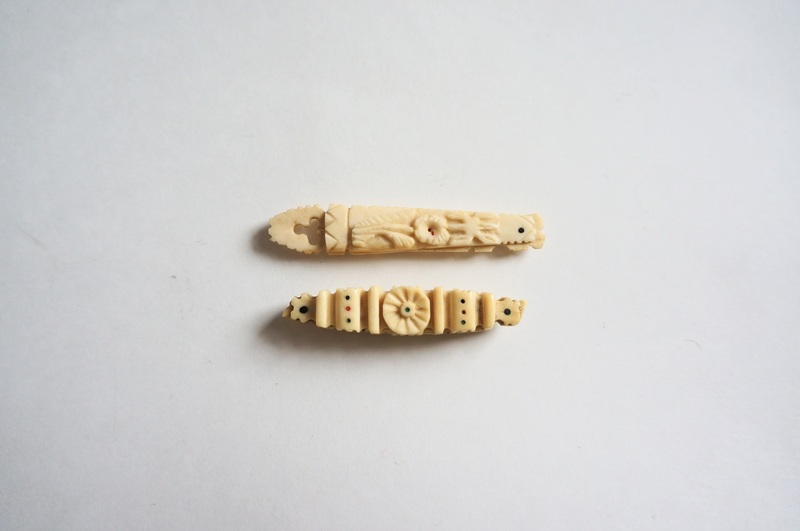 The bottom piece looks like a toothpick, which were often made from ivory back the day. I’m not sure what the one on top was made to do, but there are four different “blades” all of which are partly serrated. If you know what this was made to do, let us know in the comments! 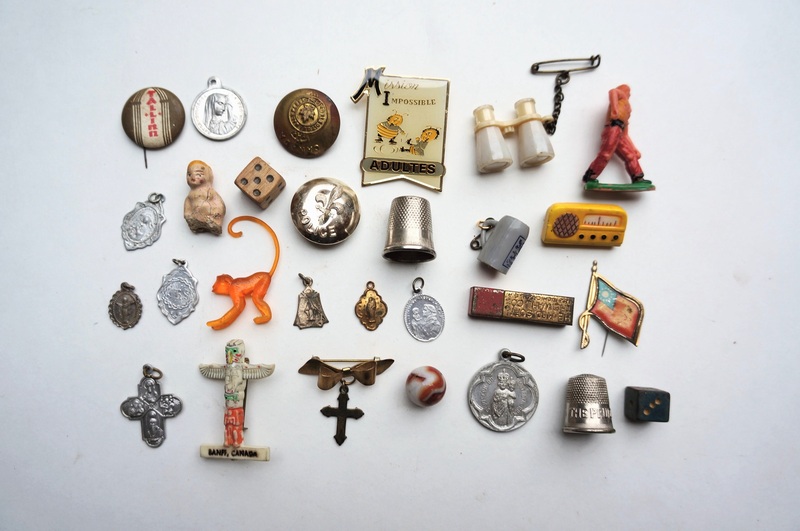 Also let us know if you have any idea what these bracelet-like objects are for! 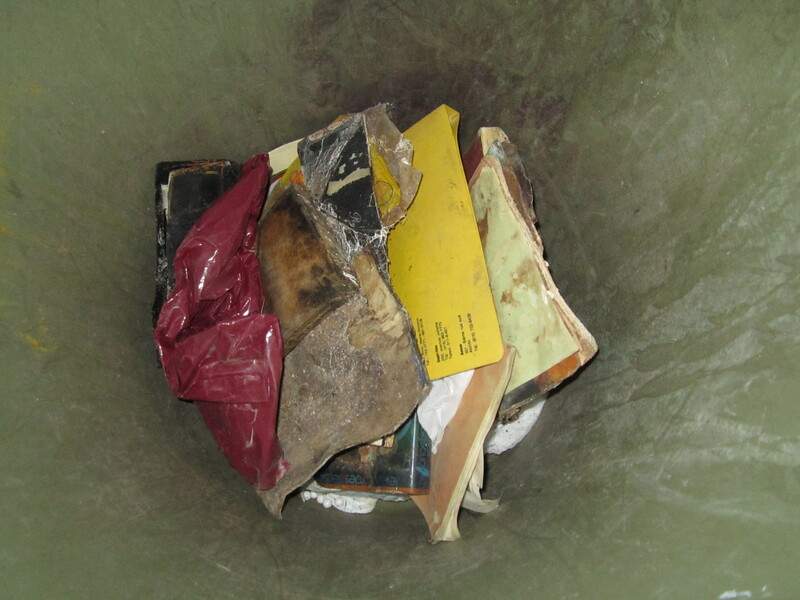 A few of the boxes (and the bottom of this garbage bin) were filled with old papers. Much was unfortunately ruined by years of moisture, but some pieces were salvageable. 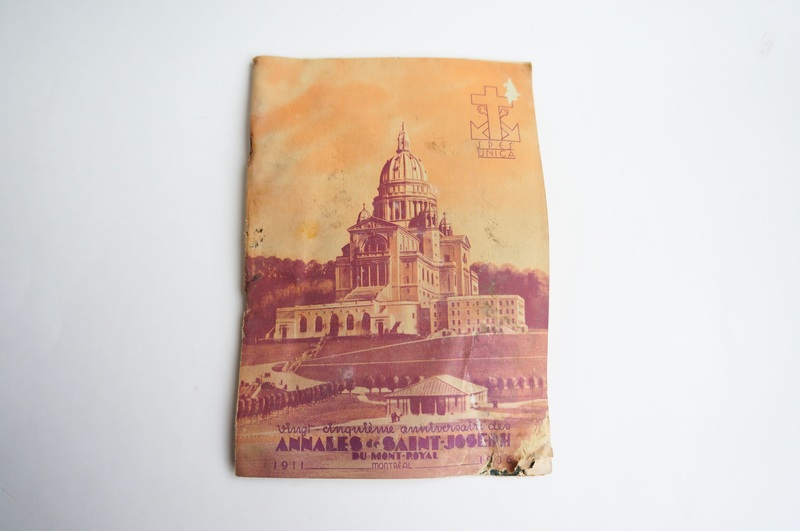 I wish this booklet, which commemorates the 25th anniversary of St Joseph’s Oratory (1936) was in better condition. 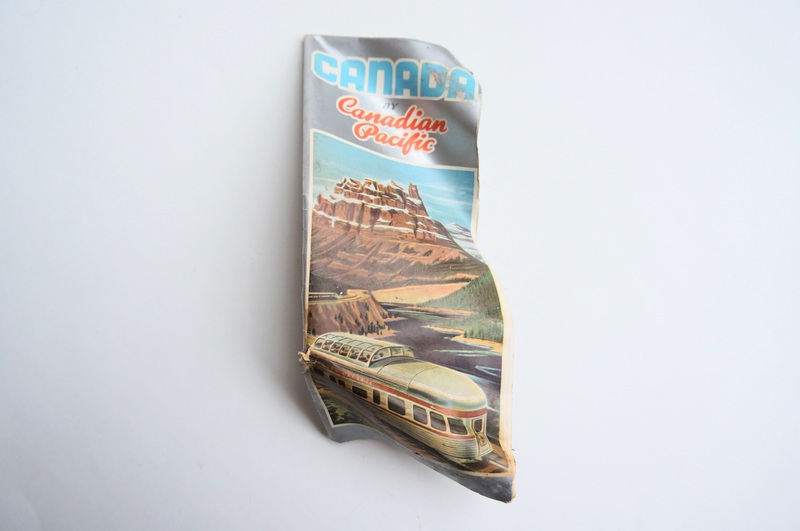 This old railroad brochure also would have been neat. Still, I was able to save several photos and postcards. 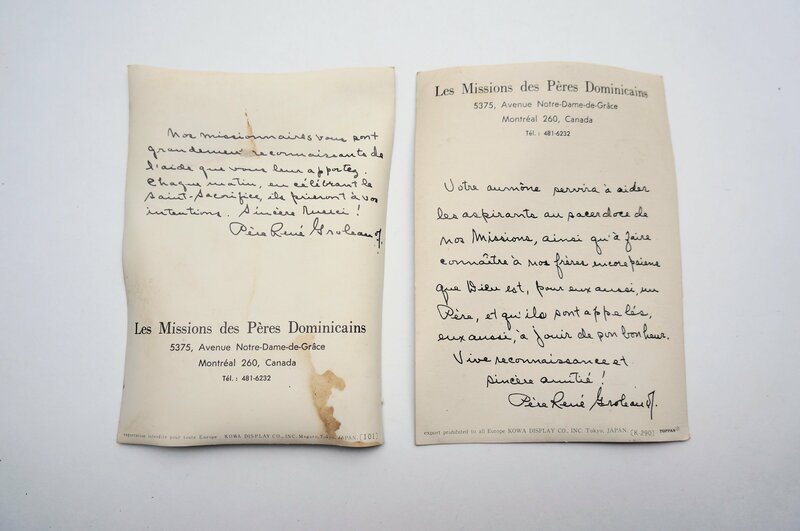 A Dominican priest by the name of René Groleau wrote a message on the back of these 3d postcards. Apparently whoever received them donated to their mission. 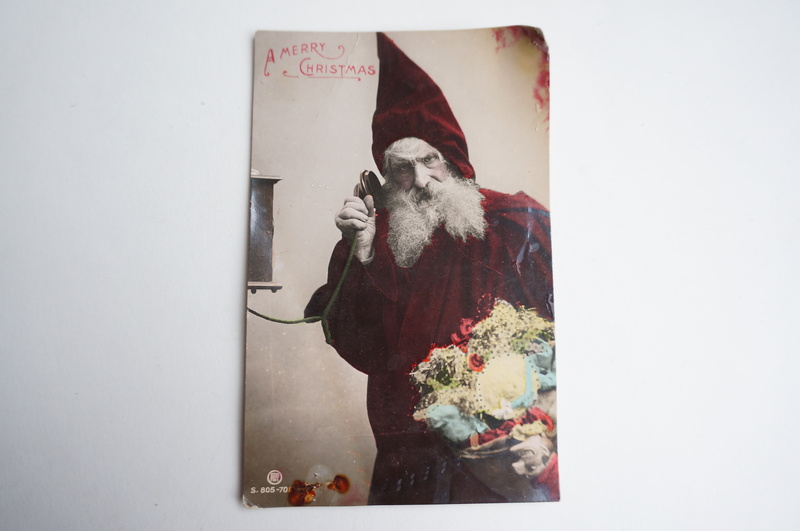 This Christmas postcard (which I’d guess is from the 20s) is a little creepy, especially once you notice the weird, upside-down doll at the bottom right hand corner like I just did. 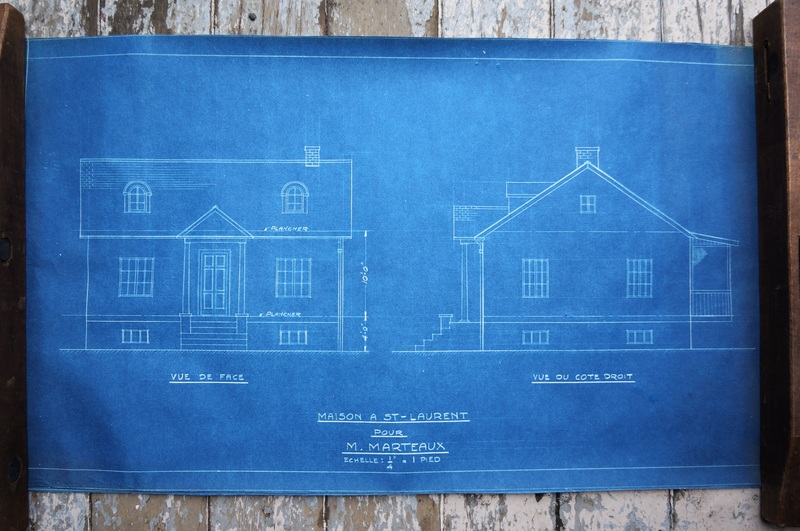 On a less disturbing note, I found some blueprints to a charming old house. I’d guess they also date from the 20s. 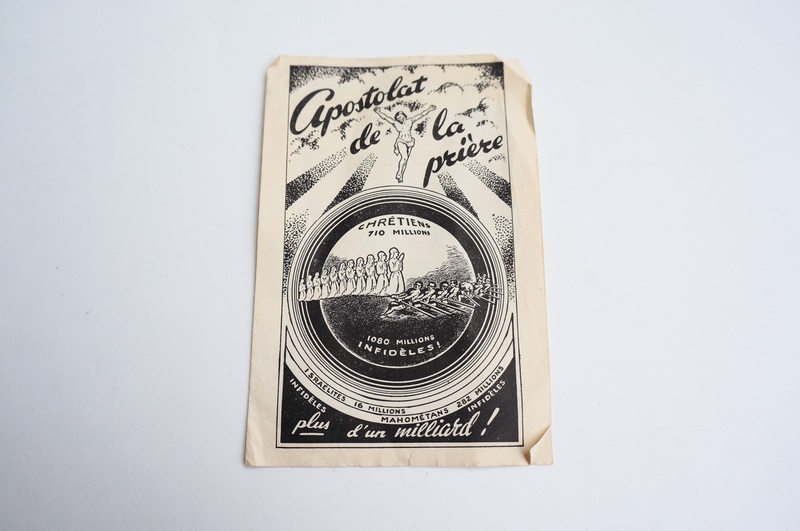 I didn’t read this pamphlet, but the artwork is interesting – as well as its claim that over one billion people are infidels. 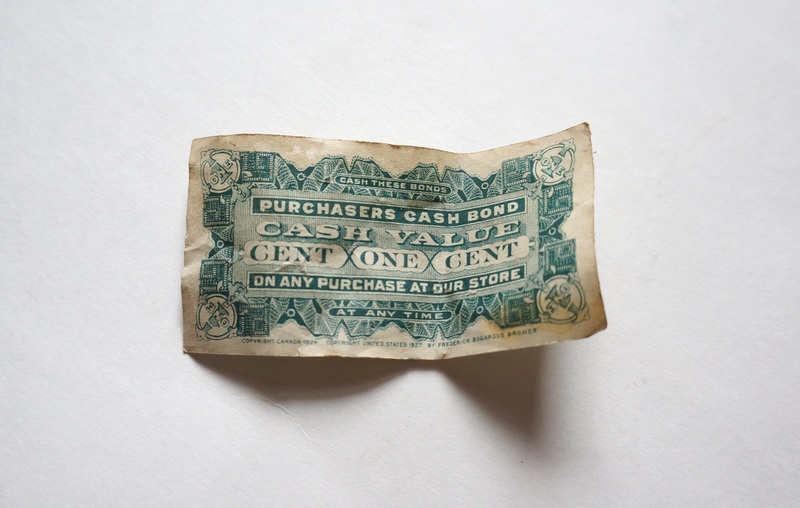 Among my favourite paper finds was this old 1 cent bond (coupon? 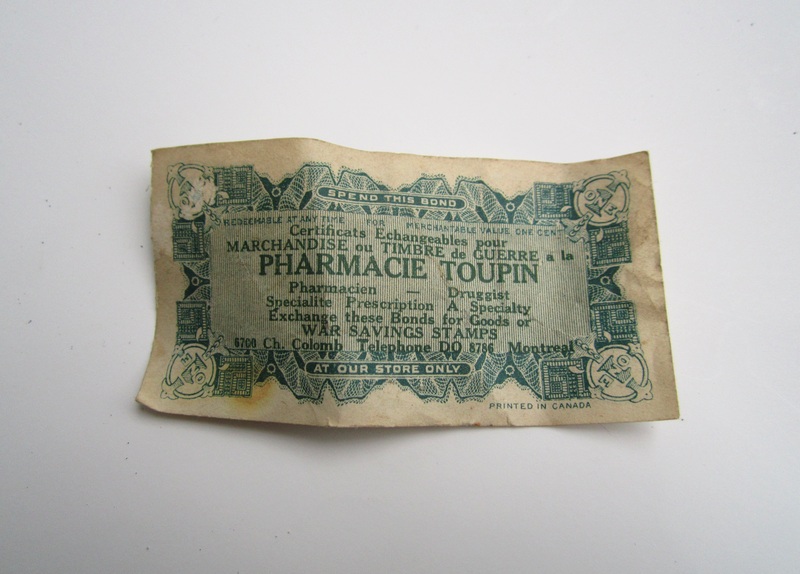 ), which was to be used at Pharmacie Toupin. Apparently the bond could be exchanged for War Savings Stamps, which is a bit confusing because it looks to have been made in the interwar period. Maybe War Bonds were issued then as well, I’m not quite sure. Regardless, it’s a pretty neat, if not particularly valuable thing to find. For reference, it’s about a quarter of the size of a regular bill. 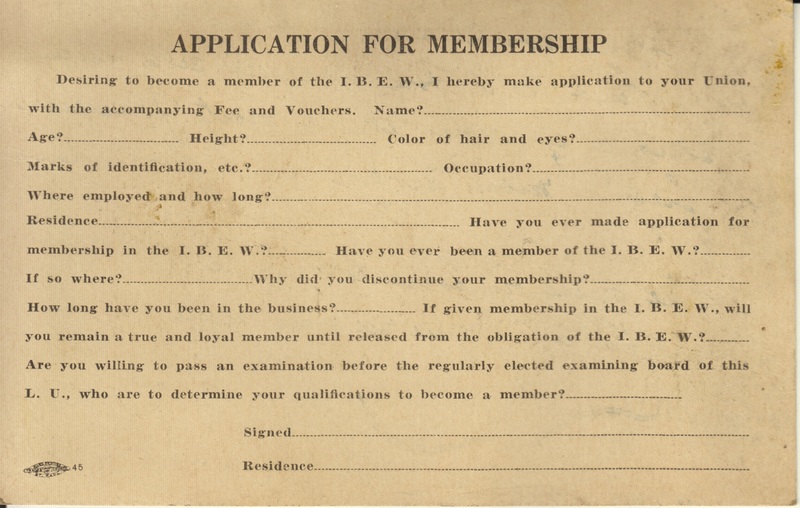 … which was this IBEW application card. 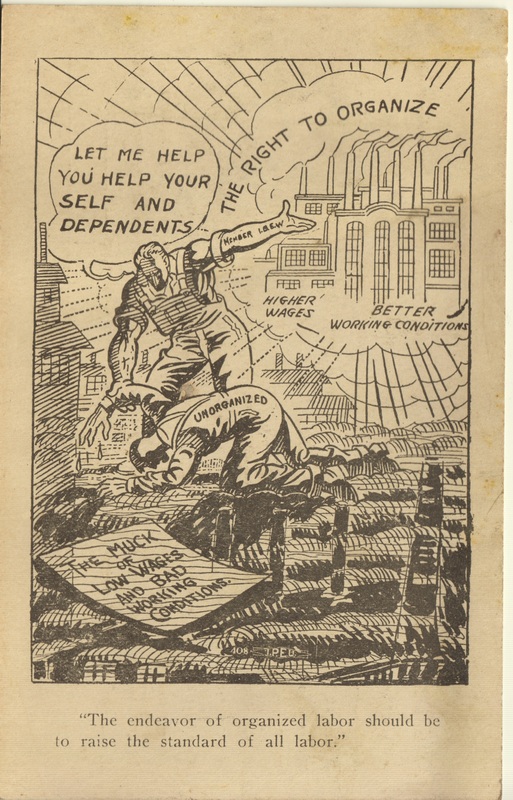 I very much like the cover image, the symbolism of which is characteristic of early labour movement art (another similarly themed image can be seen on this blog post). A strong union member pulls his near broken unorganized brother up from “the muck of low wages and bad working conditions” – a grim looking existence to say the least. The strong man offers his help (in somewhat awkward wording) and a vision of a brighter future: higher wages, better working conditions, and a pretty nice looking factory. 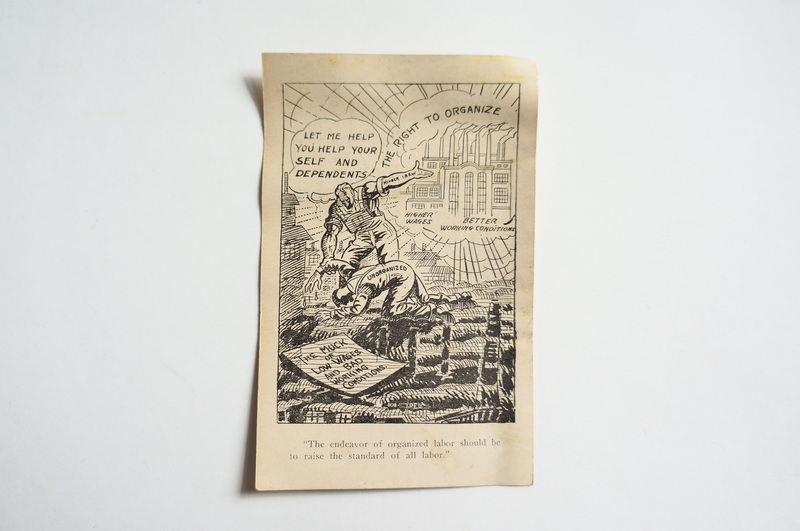 The application (which is roughly the size of a postcard) is a great window into the labour movement as it existed in the early 1900s. Unions deserve a lot of the credit for pulling workers in developed countries out of wage slavery, not to mention improving safety standards. For a quick look into what factory life was like in the 1800s check out this BBC historical summary. Unfortunately, with globalization and the decrease in transportation costs it’s now easy for companies to ship jobs overseas where regulations and trade unions are more or less impossible. The working conditions in Bangladesh for example are just about as bad as they were here in North America or Britain in the 1800s, which is depressing to think about. I could rant about this for a while, but I’ll leave it at that! I’m not sure it has a lot of monetary value, so I’ll likely just add it to my personal collection of intriguing objects. Regardless, one of the cool things about blogging is that the things I post often become searchable via Google and other search engines, so someone researching this topic will be able to find something when they might not have before. I tried, but failed to find any cards or images exactly like this one on the web, which in my mind makes it extra neat. I returned to this spot the two subsequent garbage days and found nothing. Maybe I’ll give it one more chance next week, but it’s possible that the basement (or wherever these items were stored) is now cleared out. If the bone item with the 4 sections has a spoon, and it looks like it does then it is an early grooming Kit, spoon for the ears, others for nails and teeth..really kool,,what will you do with them..
No idea. It’s hard to sell that kind of stuff (ivory is not allowed on eBay) so I might just throw them into my personal box of curiosities. I doubt they’re worth a huge amount regardless. i do not think they are ivory..they look like bone to me..from the markings and color…i quite like them..
You might be right, I have done enough research yet to conclude yet one way or the other. Ivory has a criss-cross grain; bone grain is straight. Thanks, I’ll have to look at it close up in better light. The upside down doll looks like Punch from the seaside entertainment show of Punch and Judy that we have here in the UK. (Not sure if Punch and Judy are international characters.) Great finds as always! I haven’t seen them in Canada…I’m an x-pat. Interesting, thanks for the info. I’ve heard of them before, but I’m not super familiar with them either. ACK! You left a metal tool box in the first photo, bottom right side! Lots of cool things could be done with it. Oh, I took that, just didn’t mention it. It is pretty cool. I just can’t take pictures of everything or I’ll become overworked. “I just can’t take pictures of everything or I’ll become overworked.” !!!! Gosh, I love your blog and comments! This one especially struck me as hilarious and I’m still smiling. Lol, glad you like it. Back in the day, when I didn’t find as much I took photos of near everything vaguely interesting. Now if I tried to do that I’d quickly lose my mind! There’s simply too much to keep track of. Keep doing what you doing and the way you’re doing – it’s great fun! I look forward to each and every entry! When I can’t be out there picking myself this is second best. So glad you took the toolbox! When I saw that picture, I was hoping you had taken it. Are the bracelet things for ID badges? Or luggage tag type things? Key fobs? 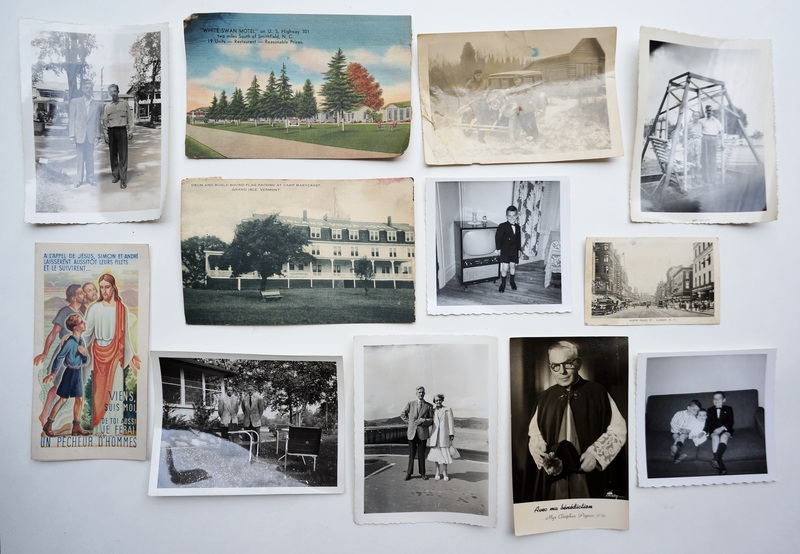 dsome of little assortments could work as posters if images reproduced…great finds! 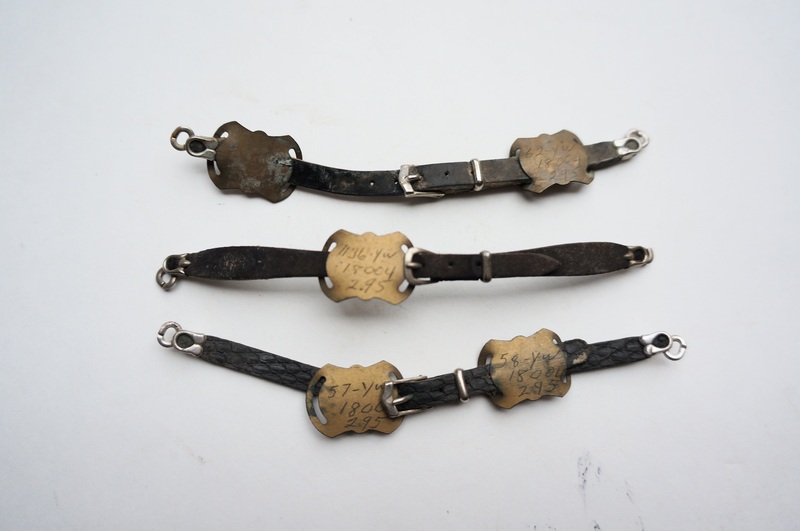 The bracelet-like items look like watch bands for ladies’ watches, with their descriptive labels attached. There’s nothing awkward about your wording … an interesting, educational and well-written post! I had a Fuller Brush letter opener just like that, only it was brown. They were given away when the Fuller Brush salesman came for a visit. I also had a pair of (now defunct) green thermometers, identical to the one you found (circa 1979/80). Oh, I meant the wording of the guy doing the talking in the image. “Let me help you help your self and dependents” is sort of an awkward way of saying that. I’ve seen similar letter openers before, but not unbroken so it was cool to find one in good shape. The thermometer works fine, and yes is very vintage. The bracelet things are watch bands with the slidey tags being inventory tags. You some great vintage stuff. 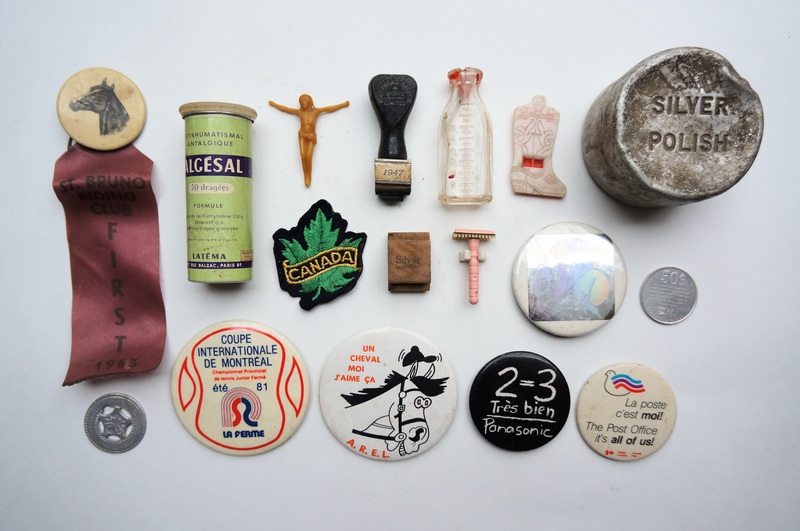 Love that old Cuba button. Thank you as always for another great post. I agree with you that it takes a lot of energy to make choices — in this case about what to take and what to leave. Our culture has created a seemingly endless amount of choices (which brand of toothpaste to buy out of 25 options… which television show to watch out of 2500 options… which song to listen to out of 25,000 options, etc.) which definitely has the potential to overwhelm the choice-making part of our body/mind/spirit! Most enjoyable ‘comme d’habitude’.The really tortured Jesus ‘macaron’ I beleive is the Jesus statue belonging to(sainte) Père-André, on display at the Oratoire ste -Joseph, of the life size model of his office d’accueil. Thanks for the info. I went there last year but don’t remember seeing it. It seems that the Catholics were very much into the “tortured” Jesus imagery though. Great finds! 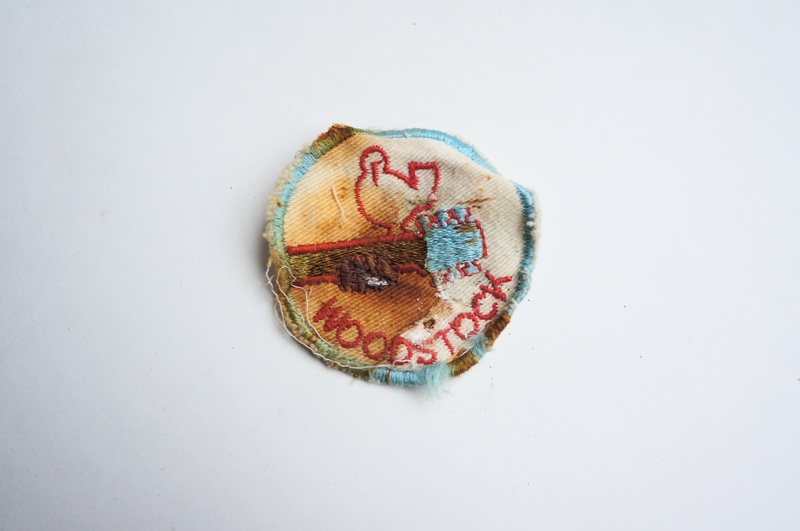 The Woodstock patch is very cool. ps: I was an IBEW member. 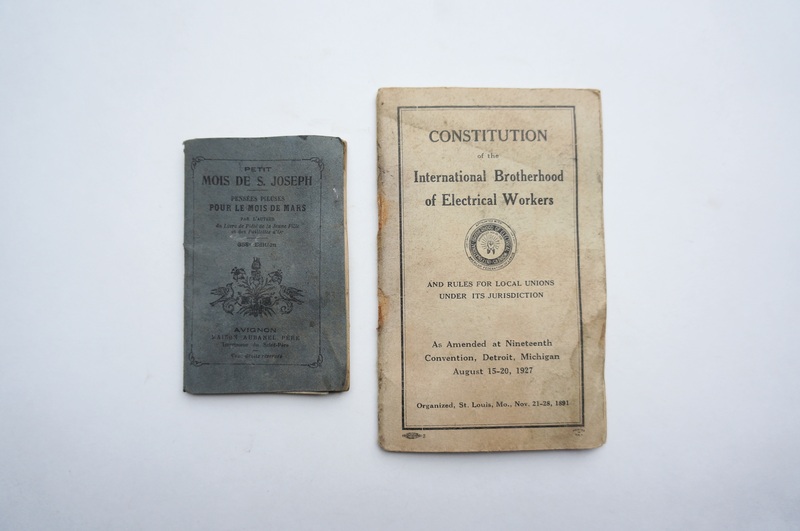 Those early pieces of union history are quite interesting. I really love your blog and how you think. Your posts are always educational, interesting, and thoughtful. AND – you do this as a business. I am way too much of a hoarder to do that and so admire you even more – it is exhausting and time consuming to sort. you make this an art form. Love the last bit of your post – about unions and working conditions, then and now, with all of the “outsourced” labor and terrible working conditions those people must endure. Thank you. Glad you like it! I try not to get too political on this blog, but I will say a few things when my finds relates to my feelings. Overall I think “free trade” has been pretty terrible for a lot of people. We’re better off making our own stuff at home, instead of letting companies get rich off exploiting people elsewhere. 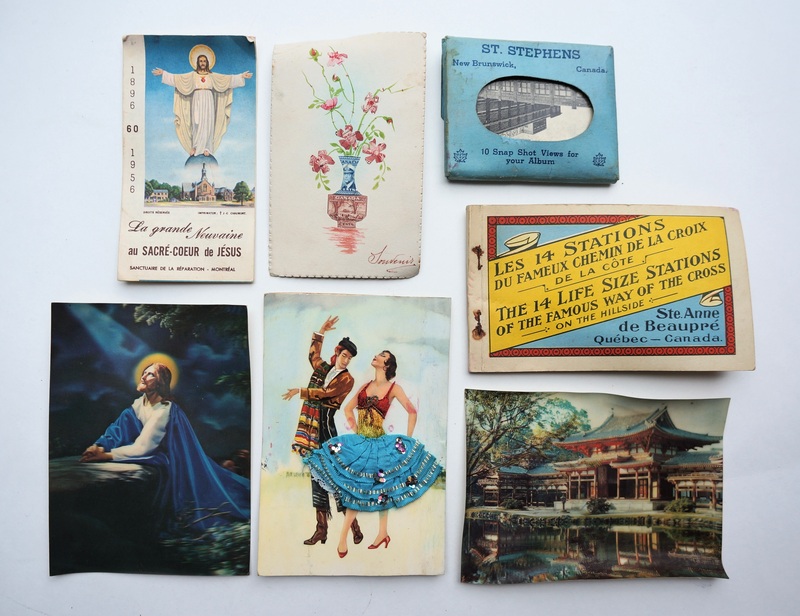 I remember the Spanish postcards with fabric and embroidery. Grandma sent me one every year from the late 60s to mid 70s. I loved them. Yours looks older though. I wish I had kept them, but thanks for the memory. I’ve seen a few like this recently. They are pretty cool, and I suspect people at my yard sales will like them a lot. I would be interested in the IBEW application card. Is it for sale and if so, how much? Thank you, A. Z.
I like it a lot as well, but am likely to keep it unless it ends up being worth a lot of money. Send me an email regardless and I can keep you posted. They are pretty neat. I haven’t received any yet, so it might be a good idea to lower the price. I still have to figure out a price for the open-faced one. I’ll send you an email about my favourite place to go for gold. 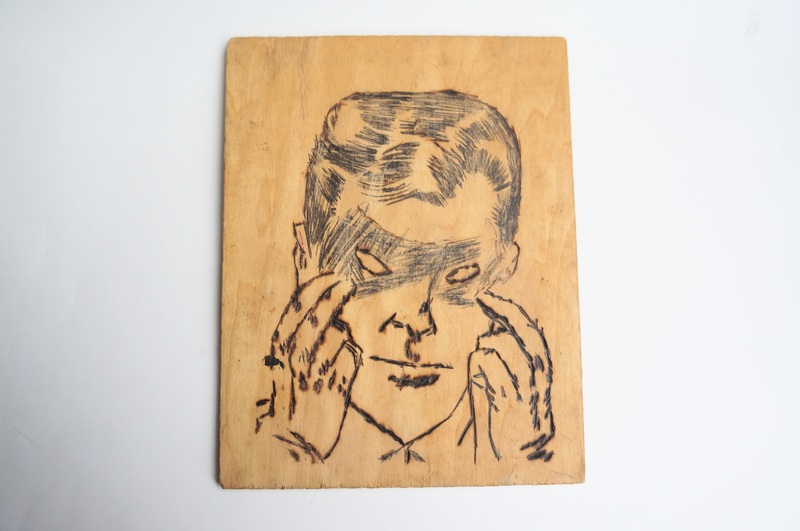 I think the etching looks like the 1960s TV version of the green hornet.